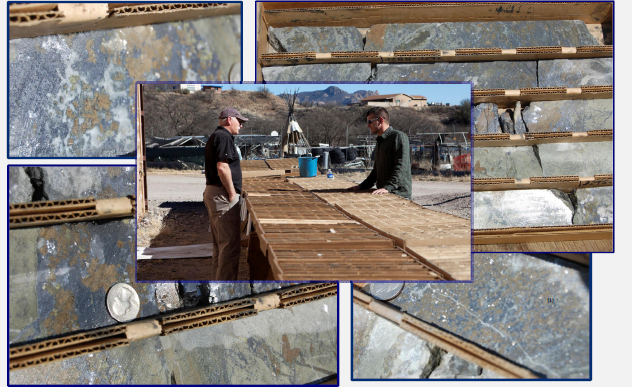 The Arizona Mining Inc. just announced a major new zinc discovery in southern Arizona. The company’s Hermosa Project is a zinc-lead-silver deposit that rivals other world-class deposits. Arizona Mining plans to release a preliminary economic assessment for the project in the first quarter of 2017. The Hermosa Project is situated on 17,500 acres in Santa Cruz County just north of the U.S.-Mexico frontier. First discovered in 2015, the zinc-lead-silver sulfide inferred resource includes 39.4 million tonnes at 11.04% zinc equivalent, and 235 million ounces of measured and indicated (M&I) silver resources. M&I manganese reserves approach 10 billion pounds. An aggressive drilling program is filling in the holes on the distribution and grade of the mineral resource. The Arizona Mining Co. plans to complete their site feasibility study by the end of 2017. Uses of Zinc (Zn): Zinc joins iron, aluminum, and copper as one of most consumed metals by human society. Zinc has strong anticorrosive properties and readily form chemical bonds with other metals. ½ of all zinc goes into zinc galvanizing to prevent rusting of iron or steel. Zinc is combined with copper to form brass, and with other metals, to form alloys used in automobiles, electrical components, and household fixtures. Zinc oxide is used in rubber manufacturing and as a protective skin ointment. Note: ‘Arizona Mining Inc. is a Canadian mineral exploration and development company focused on the exploration and development of its 100% owned Hermosa Project located in Santa Cruz County, Arizona. Image courtesy of Arizona Mining.